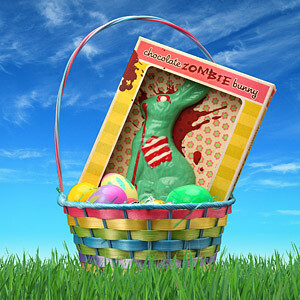 Zombie Chocolate Bunny is Just The Thing For a Happy Geekster! The lovely nerds over at ThinkGeek have a history of putting out some pretty crazy ideas on April Fool's (like the iCade, a portable arcade stand for iPads) which become so popular that they actually end up becoming real products. This is one of those cases. The Zombie Bunny was just a joke item posted a few years ago by those trickster ThinkGeekers, and people loved the idea so much that now you can buy them from the site.